"THIS PAGE-TURNING THRILLER WILL HAVE YOU UP ALL NIGHT! Who or what is walking the halls of Hart House? And will this case end up haunting Jayne forever…?" The beginning of this book got my hooked instantly. 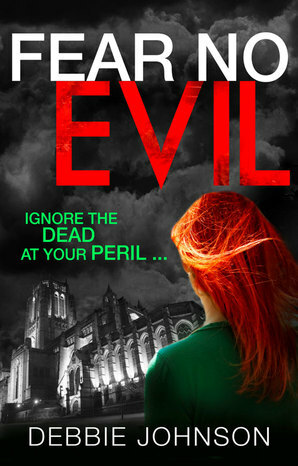 Fear No Evil is totally and utterly different to the latest book of Johnson's that I had read, Cold Feet at Christmas. The only similarities are the delicious men and the excellent writing. For fans of the supernatural thriller, this will be the ideal book but it is unique in that it is also laced with humour and oozes sexual tension throughout (although Jayne's lusting after every man in sight can get a bit tiring). In all honesty, there were times when I found Jayne to be irritating but I could deal with that as part of the overall picture. There were a couple of typos buried within and one inconsistency where a BMW was then referred to as an Audi and then back to a BMW which left me a little confused. However, Debbie Johnson is a very talented author who can turn out the best chick lit as well as an enjoyable page-turner. Thank you to the author, Debbie Johnson, and her publisher for the free copy in exchange for my honest review.